'Tis the season for tomatoes! 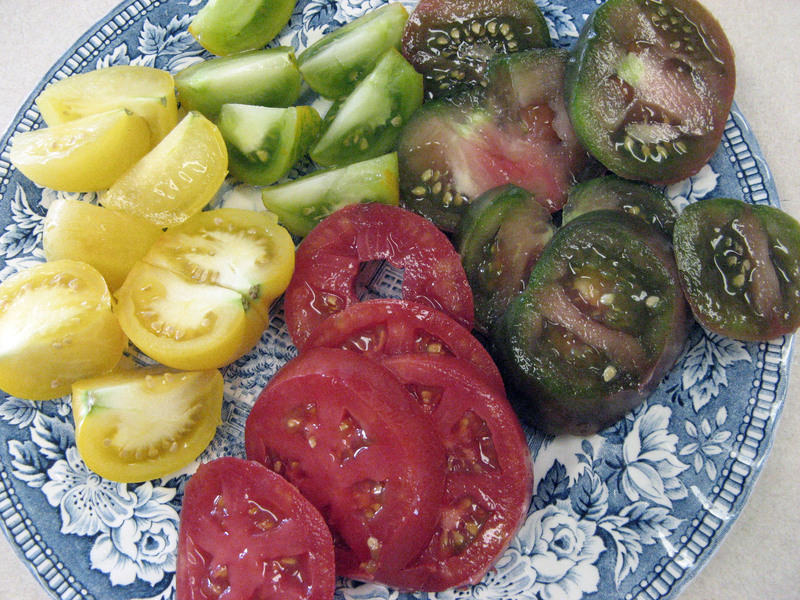 These days you can have your tomato in a rainbow of colors: red, orange, yellow, green, purple, brown. If you haven't tried some of these fascinating varieties, now is the time! My very favorite way to eat tomatoes is in Caprese Salad. I love the flavors and textures of the tomato, mozzarella and basil all mingling together. Layer slices of tomatoes and mozzarella on a plate. Sprinkle with salt and pepper. Drizzle olive oil over all. Tear basil leaves and sprinkle over top. The most common way I fix tomatoes for the family is to slice them on a plate and pour heavy cream over top. Sprinkle with salt and pepper and it is finished! Adding chopped herbs makes it even better. If I don't have any heavy cream I use mayonnaise thinned with a little bit of milk. 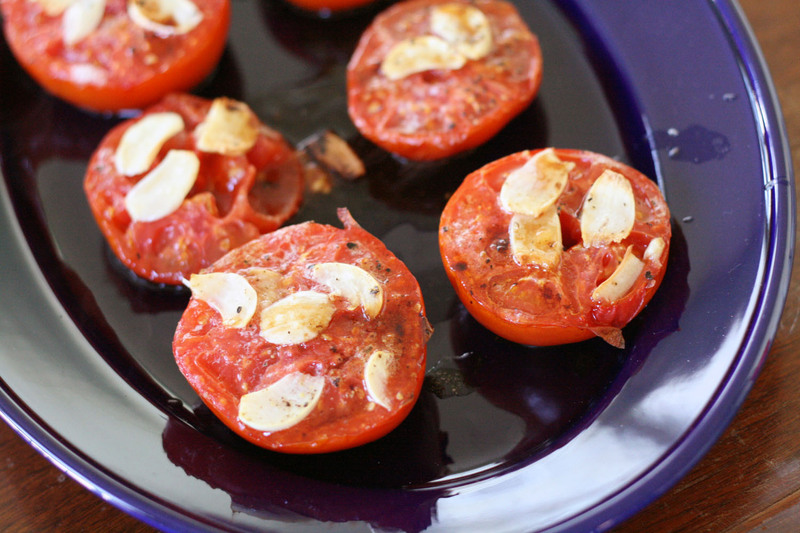 Roasted tomatoes are a nice side to have on your plate with something like fish or chicken. They are even delicious for breakfast along side eggs and bacon! Preheat oven to 400F. 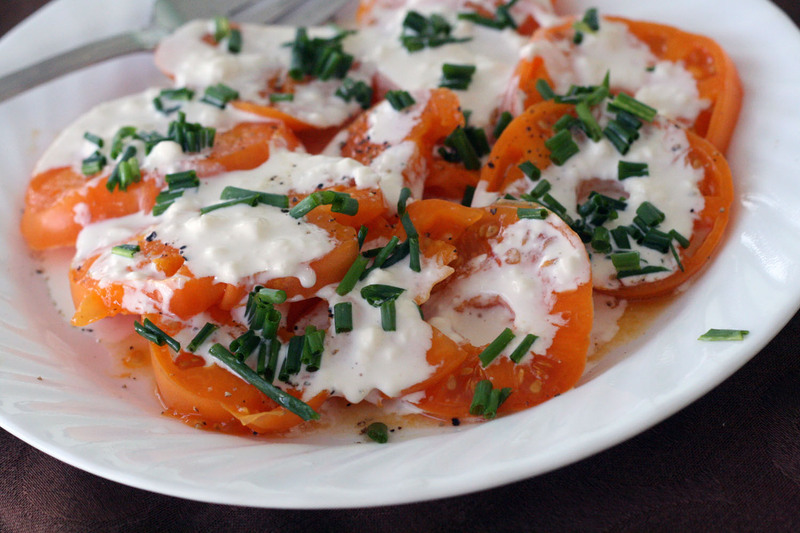 Place tomato halves, cut side up, on a large rimmed baking sheet. Dividing evenly, top with butter and garlic; season with salt and pepper. Bake tomatoes until tender, 40 to 45 minutes. I'm in love with tomatoes at this time of year too!! The other day I made stuffed beefsteak tomatoes with a filling of sauteed zucchini, onion, garlic and sweetcorn and served on a bed of mashed garlicky potatoes with a sprinkle of cilantro to garnish. Yummy!! Tomatoes are so good now. 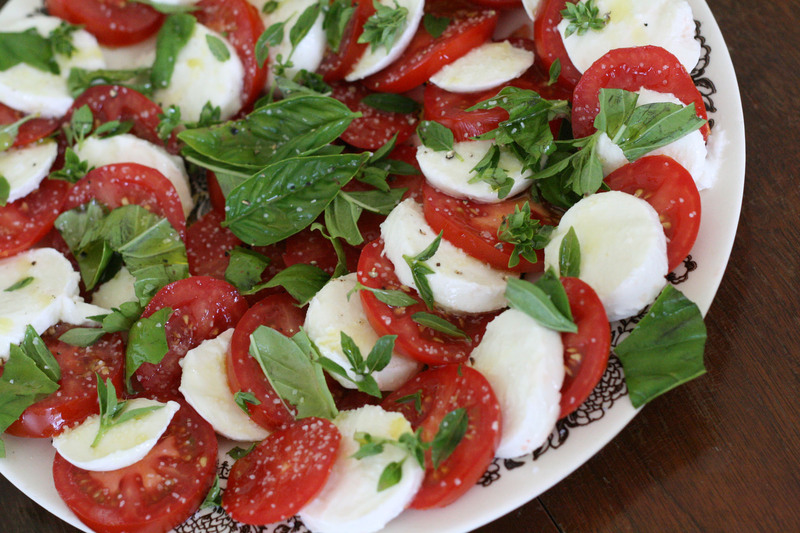 I love caprese salad & caprese pizza--thank you for posting these. I have figured out what's for dinner tonight!